Florida cops have released an image of the glassy-eyed victim of the notorious Walmart masturbator. As seen in the above evidence photo, the brown, tan, and red stuffed horse was allegedly used Tuesday by Sean Johnson, 19, as he pleasured himself inside the store in Brooksville. 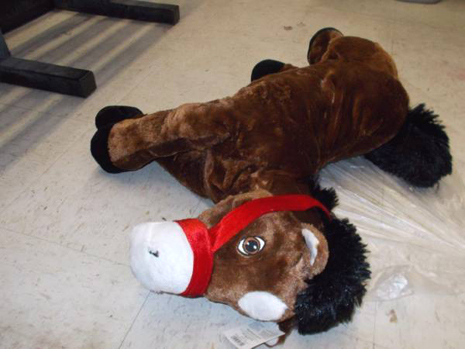 After splattering the “stuffed horse’s chest area” with ejaculate, Johnson placed it “on top of a bed in a bag (comforter set).” The toy, price tag in place, was later placed on Walmart’s floor, where it was photographed by a cop.